The Sri Lankan Legislature has witnessed many controversial happenings over the years. The august assembly’s humdrum existence and insipid routine has often given way to bursts of excitement by the unusual, irreverent conduct of its members. A former Prime Minister once tried to enter the House clad in “amude” (loin cloth) to draw attention to the price rise in clothes. Opposition Party members drove bullock carts into the premises to protest the rise in fuel prices. A Trotskyite firebrand now turned Rajapaksa lackey smuggled in a wreath to symbolise the death of democracy. MPs have marched into the Well of the House shouting slogans. “Satyagraha” has been conducted. MPs have at times run off with the symbolic mace in a bid to disrupt proceedings. Members of Parliament, despite bearing the prefix “Honourable” have heckled, hooted at, punched and kicked their fellow MPs and thrown improvised missiles at each other. Some of the miscreants were named, shamed and evicted from the House. Parliament has also been adjourned abruptly due to the conduct of MPs on more than one occasion. Despite these breakdowns in discipline and breaches of decorum in the past, there has been visible an underlying silver lining in these dark clouds. Though MPs have engaged in fisticuffs and attacked each other, they have generally refrained from targeting the speaker, prime minister and opposition leader of the day and also senior ministers. The speaker, who generally presides over the House, has often been jeered and hooted at. He (no woman has ever been speaker or deputy speaker in Lanka) has often been criticised vehemently. MPs have rushed to the podium, heatedly arguing with the Speaker. There have been oral clashes with the speaker, but never a physical confrontation. The office or institution of speaker is of crucial importance occupying a pivotal position in a Parliamentary democracy. So respected is the position that MPs refer to him or her as “Honourable Speaker” or “Mr/Madam Speaker”. It has been said of the office of the speaker that while the members of Parliament represent the individual constituencies, the Speaker represents the full authority of the House itself. He or she symbolises the dignity and power of the House over which he or she is presiding. This may very well have been the reason why the comparatively more enlightened Parliamentarians of the past refrained from launching an attack on the “Honourable Speaker”. There have been verbal attacks but nothing physical has been undertaken against the speaker in the past. Although MPs have engaged in violent antics in the by gone years, I cannot recollect any instance (I write from memory and am subject to correction) where there has been a premeditated organised attempt to attack the Speaker physically. That is until last week. The sordid events that took place on “Black Friday” in the House by the Diyawanna Oya reveal very clearly that a group of parliamentarians engaged in a pre-planned conspiracy to humiliate and physically attack Speaker Karunarathne Jayasuriya, known to the world at large as Karu Jayasuriya. So serious was the situation that for the first time in Lanka’s Legislative history, the Honourable Speaker had to be escorted into the Chamber and later outside by the Police. The threat posed was not from external elements but by so-called representatives of the people ensconced within the portals of Parliament itself. Not all the waters of Diyawanna Oya will be sufficient to wash off the black mark imposed on 16 November 2018. Chandani Kirinde, the Lobby Correspondent of our sister newspaper the Sunday Times, and the recipient of the ‘Journalist of the Year’ award this year, has vividly written about what happened in Parliament on that day in an incisive article. It is virtually an eyewitness account recorded from a ringside seat. The following excerpts from the said article provide an insight into what happened on 16 November. The above mentioned details prove beyond doubt that there was a pre-meditated plan to attack the Speaker. The events of the previous day where a wicker basket, water bottle and copy of the Constitution were thrown at the Speaker and anti-Jayasuriya slogans were raised may have had an element of ad hoc spontaneity about them. The pattern of events on Friday however demonstrated clearly that there was a deliberate plan targeting the Speaker. Why then are the pro-Maithripala and pro-Mahinda Parliamentarians so enraged against the speaker Karu Jayasuriya? It is because Karu Jayasuriya in his capacity as Speaker has given courageous leadership to those resisting unconstitutional moves by the Maithripala-Mahinda duo to seize de jure and de facto control of Parliament! A key element in the strategy devised by Sirisena and Rajapaksas to capture power through an anti-constitutional political coup depended upon a faulty underestimation of potential resistance and a cynical misreading of the responses of MPs. It was expected that removing Ranil and replacing him with Mahinda followed by a prorogation of Parliament would be accepted as a “fait accompli” and there would be little resistance. Contrary to such expectations there has been effective resistance on multiple fronts and a majority in Parliament seems to be an elusive mirage so far for Mahinda. Karu Jayasuriya’s role in this resistance movement has been both exemplary and controversial. Those seeking to grab power illegally had calculated that the “procedurally correct” Jayasuriya was weak and therefore would wilt under pressure. After all it may be recalled that the foul-mouthed Wimal Weerawansa had once referred to Karu as a “patholaya”. It was expected that Karu Jayasuriya as speaker would fall in line with the regime change despite its “illegality”. Furthermore it was thought that cobbling together a parliamentary majority would be accomplished within a few days, resulting in the regime change being accepted by the Speaker. Hence there was practically no hostility towards Jayasuriya by the Sirisena-Rajapaksa camp in the early days. In fact there was much grumbling against Karu in the pro-Ranil camp for what was perceived as a ‘non-aligned’ approach being adopted by Jayasuriya. When the Speaker accepted the President’s Gazette decree and made arrangements for the purported Premier Mahinda Rajapaksa to occupy the Prime Minister’s seat, the resentment grew and some of our trigger happy social media activists – who press enter first and think afterwards – even dubbed Karu a traitor and accused him of selling out. Little did these young critics realise who Karu Jayasuriya was! The 78-year-old Jayasuriya who had served with distinction in different capacities in the private and public sector was a stickler for propriety. He usually approached each issue cautiously and sought solutions within the accepted framework of rules and regulations. Yet the man was innovative and capable of unorthodox, out-of-the-box thoughts if and when necessary. Moreover, Karu was a man who would require some time to make up his mind but would not budge after arriving at a firm decision and his decisions were essentially based on principle rather than expediency. In this instance Karu was initially faced with a moral dilemma. President Sirisena had violated Constitutional provisions and replaced Ranil with Mahinda. He had prorogued Parliament to buy time to garner a majority in Parliament through questionable means. What happens if Maithripala and Mahinda succeed in their plans and get the required majority? Will that not legitimise the Gazetted Prime Minister and his Government? It was this dilemma which perhaps led to Karu going along with the initial Gazette proclamation though he was opposed to the prorogation. The Speaker quite rightly opined that the President should have consulted him before taking such a step. However, he now called upon President Sirisena to make amends by reconvening Parliament soon. Sirisena agreed and indicated that he would do so by 5 or 7 November. Meanwhile Maithripala uttered positive noises that he had got together the required majority. This was a blatant falsehood! What had happened was that the crossover of MPs was not happening as expected. Also political parties representing the minority communities were not prepared to throw in their lot with the Rajapaksas. Without a majority, Sirisena was reluctant to reconvene Parliament. Thus the President renegaded and broke his word to Jayasuriya. Furthermore, President Sirisena violated the Constitution further by dissolving Parliament and announcing fresh elections. This angered Karu Jayasuriya who realised that Sirisena was not to be trusted. Meanwhile several Fundamental Rights petitions were filed in the Supreme Court. A three-Judge bench issued a stay order on dissolution of Parliament and holding of elections. This paved the way for Parliament to meet again. The Court ruling that suspended dissolution of Parliament reinforced the Speaker’s position further.Karu declared that there was no Govt in the country. Under these circumstances Karu Jayasuriya took a controversial but correct decision. He was firmly of the opinion that a coup had been enacted by Sirisena in replacing Wickremesinghe with Rajapaksa as Prime Minister. In Karu’s eyes Mahinda Rajapaksa’s appointment was illegal unless he proved he had the confidence of the House. Until that time the Speaker would recognise Ranil Wickremesinghe as Prime Minister and not the purported Premier. Moreover it was important to take a vote without delay and demonstrate to the world at large that Mahinda Rajapaksa did not have a majority. In adopting such a position, Karu Jayasuriya may have been overstepping the marks of “impartiality” as a proper speaker should. But these were not ordinary times. This was a time when a powerful clique was trying to grab power through illegal means. Desperate situations require desperate remedies. So Karu Jayasuriya was determined not to let Sirisena and Rajapaksa have their way by subverting democracy. This firm decision to which he had adhered to so far is condemned by his detractors as the infamous U-turn of Karu Jayasuriya. In this situation, the immediate imperative for constituents of the UNP-led UNF and Opposition parties like the TNA and JVP was to demonstrate that the purported Prime Minister Mahinda Rajapaksa had no majority in Parliament. Likewise the Mahinda loyalists had to delay or disrupt these moves in order to prevent the truth about not having a majority being proved unambiguously. If and when Parliament proved clearly that Mahinda Rajapaksa did not have a majority then the purported Prime Minister would be deemed a “pretender to the throne” and would have no choice other than to resign as PM. His Government would cease. The Mahinda camp however wanted to thwart vote taking in the House and delay matters as far as possible. They hoped for two things. The first was to garner the required majority by intensifying the ‘hunt’ to entice MPs to their folds. The second was to hope for a favourable Supreme Court decision from a re-constituted seven-Judge bench. If the Supreme Court ruling was not in their favour, the Mahinda loyalists planned to invoke the doctrine of necessity and conduct a referendum to enable fresh Parliamentary polls. So Karu Jayasuriya went ahead and adopted an unconventional course of action for a speaker. He took the initiative to conduct a vote in Parliament against Mahinda Rajapaksa. The Speaker did not go through the usual procedure of conducting a vote of no confidence after the motion was placed on the Order Book and a minimum number of days passed. Karu simply went ahead with the vote after Standing Orders were suspended. When Mahinda’s MPs obstructed by shouting and hooting, the Speaker took a voice vote. Thereafter, in an unusual move which angered the Rajapaksa camp immensely, the Speaker declared that the appointment of Mahinda Rajapaksa as Premier was invalid as he had lost the confidence vote. He also stated that the “new” Government was illegitimate. Such a proclamation has never been made by a Speaker before. But then such a situation of a prime minister being arbitrarily replaced by a president also had not happened before. What is going on in Sri Lanka now is a political power struggle of disproportionate dimensions. Ranil Wickremesinghe has the support of at least 122 MPs in a Parliament of 225 MPs. Therefore he is keen to display his majority clearly and officially and bring about the exit of the purported Prime Minister Mahinda Rajapaksa. Ranil’s weak point however is that he is unsure of enjoying such a clear cut majority in the country at large. Given the results of the local authority elections where the newly-formed Sri Lanka Podujana Peramuna (SLPP) led by Mahinda Rajapaksa outshone both the Wickremesinghe-led UNP and Sirisena-led SLFP, the prospects in a parliamentary poll seem brighter for Mahinda. So Ranil would like the current tussle to be confined to Parliament alone where he is on top and Mahinda is at a disadvantage. On the other hand Mahinda appears to be supremely confident that he would be the winner in a general election. The realignment with Sirisena has strengthened his hand further. He would prefer the battle to be fought on favourable terrain rather than hostile territory. Given the current configuration in Parliament, the House by the Diyawanna is unfriendly terrain to the Rajapaksas. The local polls results however indicate that the country at large is favourably disposed towards the Rajapaksa-led SLPP. So Mahinda and his camp followers call for a general election while Ranil and his fellow travellers are uncomfortable at the suggestion. So Ranil wants to establish his Parliamentary majority and continue in a business-as-usual mode but Mahinda wants a general election since he has been unable to capture power by reconfiguring the current Parliament. This enables Mahinda to take the moral high ground in one way and for Ranil to do the same in another way. It is against this backdrop that the role of the Speaker becomes crucial. Mahinda Rajapaksa wants Karu Jayasuriya to recognise him officially as the Prime Minister and give due recognition to his Government. Karu Jayasuriya however has not done so. Having made up his mind firmly, Karu has refused to recognise Mahinda and instead opts for Ranil. This is not mere political partisanship as alleged by Mahinda and Maithripala. Karu Jayasuriya’s stance is due to his firm conviction that democracy is in danger and Parliament is threatened because of Sirisena and Rajapaksa. 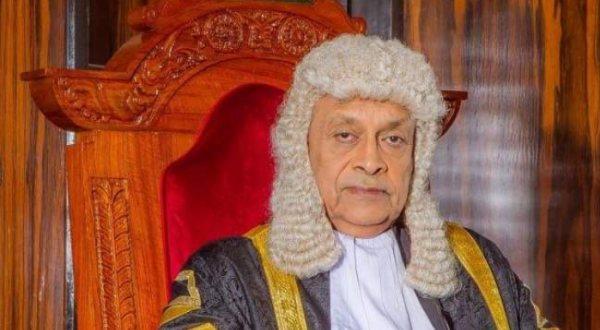 Karu Jayasuriya is convinced or has convinced himself that he as Speaker has to fulfil the sacred duty of defending parliamentary democracy and the rights and supremacy of Parliament from “barbarians” out to destroy or distort those lofty concepts. Thus Karu Jayasuriya remains strongly opposed to the purported Premier Rajapaksa and his new dispensation. The Speaker has gone beyond the call of ordinary duty in conducting no confidence votes on Rajapaksa despite the formidable odds against him. He has even risked physical danger to himself in doing so. Karu has refused to be cowed down by the “terror tactics” of pro-Mahinda MPs. Even in the case of the no confidence motion against the purported Prime Minister, the Rajapaksa lobby argued that the speaker should recognise Mahinda as Prime Minister first and entertain the no confidence motion by adhering to correct procedure of placing it on the order paper with due notice given. But as stated earlier the usually “procedural” Karu Jayasuriya has not done so. Instead he has conducted two voice votes amidst much violent opposition. This is because Karu Jayasuriya opines that the appointment of Mahinda Rajapaksa is illegal and has to be eradicated as early as possible. In a clash between right and wrong there is no room for neutrality or non-alignment. Thus Karu Jayasuriya is determined to oust the purported Prime Minister and restore Ranil Wickremesinghe to his rightful place. The Speaker sees this as his historical task and sacred duty. Karu Jayasuriya’s strength and courage to stand firm in this exercise in the face of violent hostility from the Maithripala-Mahinda forces is derived from his belief of being morally and legally correct. Karunarathne Jayasuriya is a man with a mission and vision. By standing firm against Mahinda and Maithripala’s efforts to capture power through foul means, Karu Jayasuriya has succeeded in exposing the true nature of his power-hungry opponents. They demand a vote by name but do everything possible to disrupt such a vote and necessitate a voice vote. Then they blame the Speaker for it. But what has truly upset the people who saw the attack in Parliament on the Speaker was the nonchalant, non-interventionist attitude of Mahinda, and other seniors like Dinesh and Chamal. It was as if they tacitly endorsed the anti-Speaker violence. Karu Jayasuriya may have done wrong, but this does not justify attacks by MPs on the Speaker in the Chamber. This sight worries all right-thinking people. If the Speaker can be attacked in this way even before Mahinda Rajapaksa is legitimised as Prime Minister, then what lies in store for the country if and when Mahinda forms a legitimate government? If the Speaker can be targeted so brazenly in Parliament, what will be the plight of people who cross the Rajapaksas when they enjoy full power? Another question puzzling and upsetting the people is why Mahinda Rajapaksa is trying to grab power through the backdoor instead of coming in through the front door. One does not know the final outcome of this ongoing political power struggle and cannot predict how events will play out in the future. But a notable feature of the emerging scenario is the growing stature of Karu Jayasuriya. There is immense support and backing for his strenuous efforts to safeguard the supremacy of Parliament and parliamentary democracy. There is a groundswell of politically non-partisan opinion that the anti-Constitutional attempts of Mahinda Rajapaksa to seize power through a coup enacted by Maithripala Sirisena should be resisted and defeated. This is now growing into a people’s movement cutting across race, religion, caste, creed and even class to a limited extent. The deposed Prime Minister Ranil Wickremesinghe in spite of his faults is seen as the symbol of this movement. The inspirational spearhead of this movement is Karu Jayasuriya through his courageous action in Parliament. The phenomenon of Karu Jayasuriya’s increasing personal popularity is not lost on his political detractors. There have been increasing accusations that Karu Jayasuriya is doing all this with a view to contest the presidential poll by increasing his political clout. One does not know whether the 78-year-old Karu Jayasuriya has any political ambition in this regard but there is nothing wrong in his becoming president or prime minister. If Mahinda rejected by the country can aspire to power again or Maithripala can cling to power by backstabbing and betrayal, why can’t Karunarathne Jayasuriya seek office through legitimate channels if the people want it so? As stated earlier Karu Jayasuriya is fighting this political battle with the noble aim of safeguarding parliamentary democracy. His courageous defiance of Mahinda Rajapaksas minions in Parliament is a key element of this fight. However it is certainly true that Karu’s political popularity and stature has increased considerably due to his bold stance. His political opponents who accuse him of ulterior political ambition must realise that they themselves are to blame for this. It is the outrageously anti-democratic power grab – aided and abetted by Maithripala – of Mahinda Rajapaksa that has impelled Karu to enter the fray and spearhead opposition to the illegal attempts. If Karu Jayasuriya is now walking tall, it is entirely due to the political endeavours of the Maithri-Mahinda camp. None know what the future holds, but Karu Jayasuriya by his courageous defiance of Maithripala and Mahinda has demonstrated that he is no pushover as envisaged by his political adversaries. Moreover, his brave conduct in these dark times may result in the possibility of Karu Jayasuriya going down as the most heroic Speaker in Sri Lanka’s Parliamentary history. « Three Non – Cabinet Ministers Along With Seventeen State and Seven Deputy Ministers Sworn in Before President Maithripala Sirisena.